Our friends on DS9 stumble on a baby Changeling, basically in the way now-human/once-Changeling Odo was found back in the day. Odo tries to bring the baby out of his shell in gentler ways than Bajoran scientist Dr. Mora (James Sloyan, returning from “The Alternate” back in season two) did to Odo. 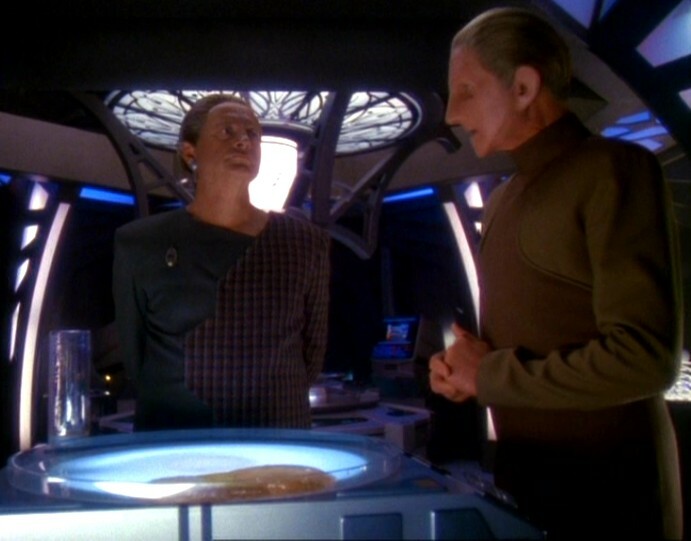 The methods seem to be working and the Changeling begins to bond with Odo … but it eventually dies thanks to some radiation it encountered before the DS9ers discovered it. But, as it dies, it merges with Odo … who becomes a Changeling again, as a result. Sigh. Another sci-fi character with daddy issues. Odo regaining his shapeshifting abilities is a huge domino for DS9. After he becomes a Changeling again, he sort of reverts to what he was for much of the third season — an outsider whom the Founders very much want to return home — as opposed to the pariah he was in the fourth season (after he killed another Changeling in “The Adversary”) or the struggling human we had been since he was made human in “Broken Link” for killing that Changeling. 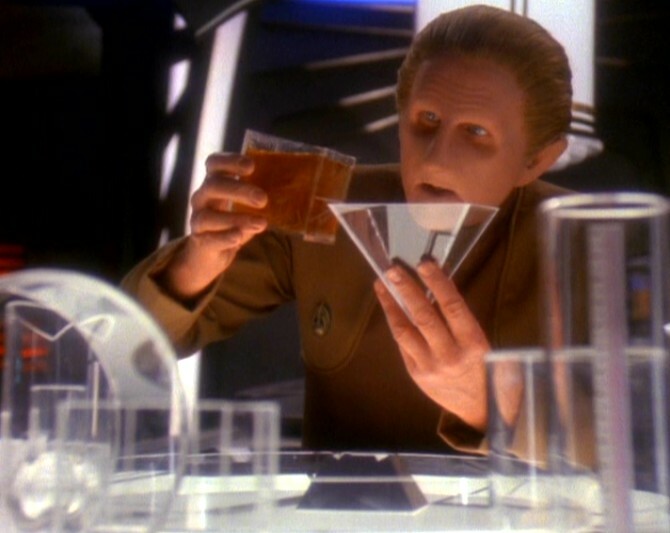 As a Changeling, Odo helps shape the future of the Alpha Quadrant in the final days of the Dominion war, as we’ll get to in later reviews. It’s very unlikely he could have had the impact he had as a human. Oh, yeah. And this happened. The subplot in this episode — where Kira has the O’Briens’ child that she’s been carrying since late in the fourth season — is pretty by-the-numbers. We see Shakaar (Duncan Regehr) again, but in a pretty meaningless role. You might wonder why his elevation to Bajor’s first minister in the third season didn’t warrant mention on this site. Basically, his impact after that episode was as Kira’s boyfriend, not as a Bajoran political leader. And his presence here is just annoying, as he and O’Brien jockey for position in the birthing process. Beyond that, it’s annoying that the baby Changeling seemed to be doing fine and then so suddenly gets ill and dies. I know the creators sort of foreshadowed this by saying it was ill to start the episode. But they really made the events here too much of a gut punch for Odo. That complaint aside, this is really a strong episode that’s well acted on the Odo front. Bringing back Dr. Mora and giving Odo some closure on his difficult upbringing (if you can call it that) was nice. Rene Auberjonois really shines in an episode in which he spends a lot of his time speaking to a beaker full of goo. There’s also the nice bit at the end where Kira, now childless, confers with Odo, who is also childless. Although the whole idea of Kira carrying the O’Briens’ child was a way to explain Nana Visitor’s pregnancy, the payoff in this episode’s final scene is a nice moment. Now … there’s the matter of “Dr. Bashir” in this episode that we’ll get to soon. Here comes the Dominion. Hold onto your butts!